Addy’s boss has been murdered. She’s next. She’s been folded into something that supernatural forces want, and it looks like she’ll have no choice in the matter. Tab’s been through hell to make sure this sort of thing doesn’t happen—literally. The red-winged Angel of Free Will cares vehemently about individual agency in human destiny. How much he cares about Addy herself may be another thing entirely, but at any rate, she has a better chance with him than with the rest of the Angelic family, Fallen or otherwise. In a run for her life and a race in which the involvement of the Devil himself is considered among the least of their worries, Addy must find enough moments of calm to unfold the Angel’s Grace inside her, learn from the visions it provides, and find the keys to Heaven and Hell. I closed my car door on the thought—and the sight of my boss and friend lying there—and palmed the remote that would lock the doors. I had left the key in the ignition to make for a faster getaway. I closed my eyes and listened to the gulls and the surf on the shore and relished the soothing silence it brought to my mind. My troubles dimmed under the warmth of the sun on my face, the hurt washing out with the tide. Novocain for the soul. 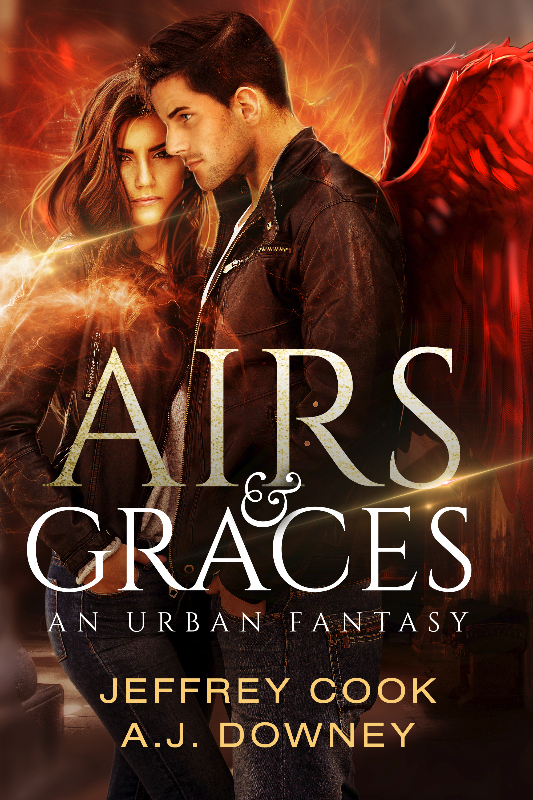 Airs & Graces, an urban fantasy novel by Jeffrey Cook and AJ Downey, was released in July and is currently available in print on Amazon. This entry was posted in New Release and tagged book, fantasy, fantasy novel, supernatural, urban fantasy. Bookmark the permalink.